I was sent an email asking if I had any more magnet sets laying around like the ones that I'm putting into my Giveaway box. Absolutely! I responded and here they are. 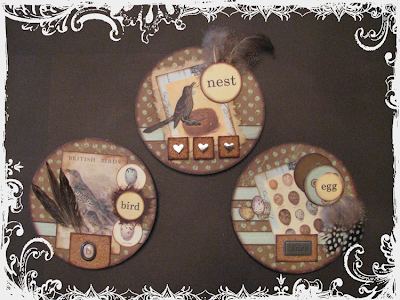 I've put them all up in my blog shop (although Jodi has laid claim to the "Bird" set.) 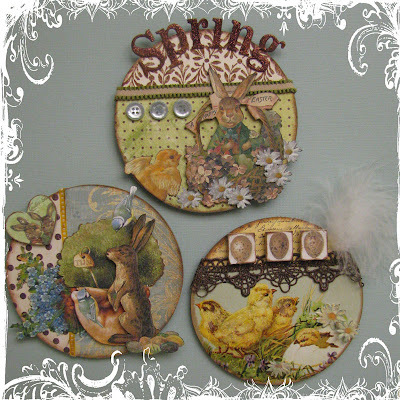 The ones above are made with vintage Easter postcards + one contemporary card. This is one of my favorite sets. I made the scrolly bits from rusted floral wire. This is the one for Jodi. I do hope she enjoys it!!!! If you would like to purchase either of the other two sets you can click here to be taken to my blog shop!! Karen, your magnets are wonderful. I love the bird ones, but I love birds. Beautiful work. ADORABLE!!!!!!!!!!!! You do such beautiful work! LOVE the Easter ones. We had snow again today. Can you believe that? Thank goodness I had planted pansies & their sweet bright faces just keep smiling no matter the weather. Those Easter maganets made me smile so thank you for sharing those with us. Love the magnets! They are really wonderful. I am here in Az and I enjoyed my first day sitting in the sun and visiting with my mom and sister. Your magnets are sooooo cute!!! I love you work... so creative! I love the old easter set. Oh, so cute!!! Your magnets are very beautiful. They are all so pretty, Karen! I love the ones you did with the wire. love your magnets! the spring set is really cute. but i also love the bird ones. Your magnets are fab, great idea. Oh my gosh! These are so neat! Makes me want to clean off everything that's on my fridge and start over but this time ONLY your magnets...I wonder if my family will cooperate with this idea...sure they will...I will be strong and once they see your magnets...they will comply...because your magnets deserve a showplace all their own! All three sets are just so lovely, I couldn't possibly pick a favourite. All three sets are so adorable. I just love everything you create. I'm tickled pink I found your blog. Thanks for listing the magnets. These are wonderful. Great job. How adorable! You are so creative! 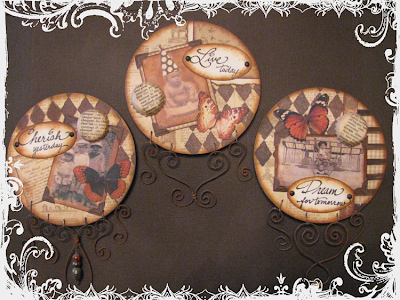 I love that you used old postcards...one of my favorite things. I have a collection of them, and can't quite make myself cut them up...oh well! Have a good day! These are wonderful Karen! So cute. No wonder Jodie had to have them. It's so funny about those pillows and frayed flowers, now that I have started making them I cannot seem to stop. I have many pillows started, for all over the house. I love your magnets. Wonderful images. You are so creative. I want to make some for my fridge! your magnets are so cool and original! These are fantastic!!! While they are all lovely, the bird ones are my top choice - no wonder they are already taken!!! Beautiful!!! Your art has a very unique style and identity - really beautiful stuff. Karen, the magnets are very nice. What size are they? I love your idea about the blog book..I have a book that I use to keep up with stuff on the blog and etsy. Helps when I have one of those moments!